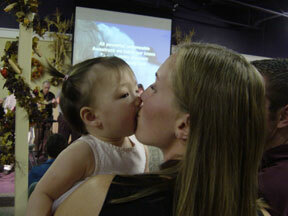 On Sunday we were able to dedicate Katie to the Lord. 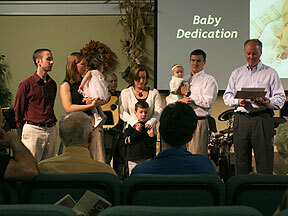 In our church, baby dedication is where the parents are vowing to help their child grow up and come to a saving knowledge of Jesus Christ. 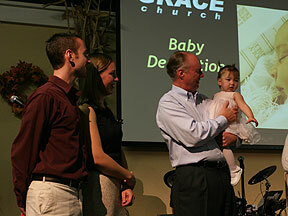 In no way does this baby dedication say that we believe that Katie is now saved but just that we will teach her about Christ as she grows up. Katie did well during the whole time up on stage. 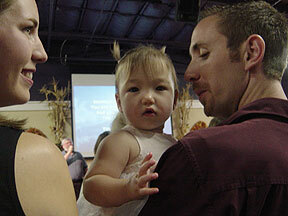 Even though she was a bit wiggly during the prayers, she never once cried while we were up there. Thank you to all of our friends and family who were able to make it up for our special morning. "Hey, are you looking at me?"